Sony certainly knows how to branch out in terms of product variety, and one of the niches that they have tried out in recent memory (instead of spearheading it) would be the digital camera market, and I must say that their DSLRs are decent offerings, although you still find most wedding photographers stick to Nikon or Canon for their work. Well, this has certainly not stopped Sony from rolling out newer models in due time, and this time around, we have the Sony α57 that will be the latest addition of their popular line of A-mount cameras which employ Translucent Mirror Technology. Just what does the innovative Translucent Mirror design offer? For starters, it is capable of directing incoming light to the CMOS image sensor and the AF sensor, both at the same time, so that full-time continuous AF during both still and video shooting will be able to happen. Not only that, users are also able to frame, focus and preview shots in real-time thanks to the high-resolution Tru-Finder electronic viewfinder. This delivers a wide viewing angle and 100% field of view for the end user, so that photographers know that what they see on the screen is exactly what they will capture. 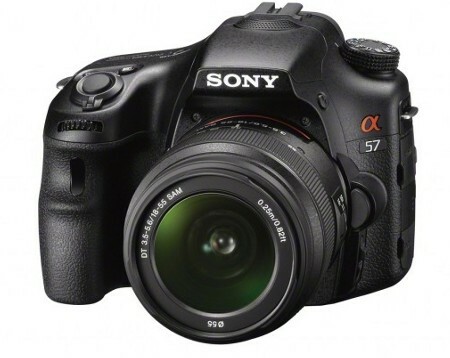 The Sony α57 is said to be the natural successor to Sony’s α55 camera, where it is specially positioned to target a wide audience of DSLR users. It is capable of shooting still images at up to 12 frames per second, record your video memories in full HD video at 60p, 60i or 24p frame rates, and also boasts of a wide range of creative modes that include Auto Portrait Framing, a world’s first technology. How about shooting portraits? Well, novice photographers are able to see the quality of their work increase, thanks to the new Auto Portrait Framing, which is a world’s first technology as mentioned earlier. The Sony α57 will rely on face detection and the compositional ‘rule of thirds,’ making sure it knows just where your subject’s position is, trimming the scene in order to create a tightly framed, professional-looking picture – regardless of whether it is in portrait or landscape orientation without sacrificing the original image. It will save both sets of photos so that you can make a comparison after a hard day’s work, letting you refine your portrait skills after that. Expect the new α57 interchangeable lens camera to hit worldwide markets this April with an 18-55mm kit zoom lens for $800, and if you just want to pick up the body only, it will cost you approximately $700.